There are over 1,000 of Public Listed Companies(PLC) in the Bursa Malaysia. How do you select a stock to invest in? Do you use Technical Chart and Fundamental Analysis? Some just takes the easy way by listening to rumour or tips. Most of the time, the horses mouth tips is not reliable as it has passed so many medium. It’s a fact that 80% of stock market players lose money! Therefore, it’s important to do some analysis before investing in any stocks. One of the good filter is to buy a good fundamental company. The profit earned should be reflected in the share price and dividend declared. Do you know some good companies i.e Digi, Amway etc, paid over 100% of the earning as an dividend? You may ask me how to find a good companies to invest in. 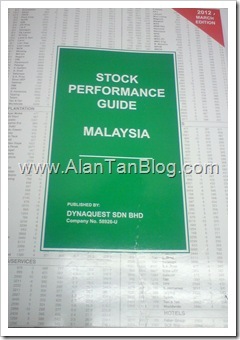 I found that it help to get a copy of Stock Performance Guide Malaysia by Dynaquest. It contains a price chart, complete Corporate Information Section and Latest earnings & dividend forecasts. Past ten years’ price range, earnings per share (EPS), dividend per share (DPS), dividend yield (DY) and price earnings ratio (PER). Information on derivatives and potential dilution. 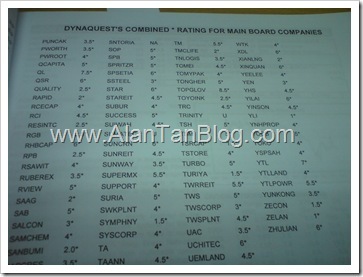 What I like most is the Dynaquest company rating which range from unrated to 12 star. 12 star is the strong and best company to invest in. For example, once a friend or analysis recommend a stock, you can look at company fundamental and the star rating. I only invest in company that have min 5 star and above. If you just follow the star rating strictly, you minimize the chance of investing is speculative and losing money company like TimeCom, Utusan, Zelan, Mycron etc. Stock Performance Guide Malaysia was published twice a year and available for sales in all major bookstores which cost RM70 per copy. Every stock investor must have a copy of this guide(Stock Market Bible) in order to make an informed decision. This entry was posted on Tuesday, July 31st, 2012 at 1:47 pm	and is filed under stock market. You can follow any responses to this entry through the RSS 2.0 feed. Both comments and pings are currently closed.